Every brush in our DS Artisan Signature Collection™, is individually hand crafted in the finest materials. Multi-purpose luxury brushes that offer premium professional performance for all your styling needs. 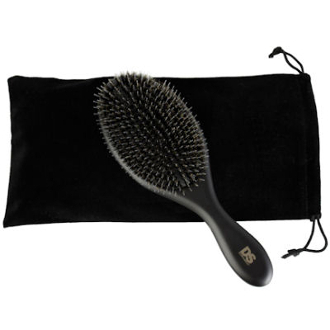 Heat resistant, ionic infused nylon bristles, combined with root and scalp stimulating natural boar bristles, gently polish, shine and smooth your hair. Our performance contouring pad gently shapes and cushions for comfortable brushing, detangling, styling and blow drying usage. This premium contouring pad combined with gentle flexible bristles are designed to perform; while reducing breakage, promoting hair growth and are gentle enough for extensions. Our Artisan hand polished natural wood handle undergoes an intensive special Nano Carbon infusing treatment that makes our brushes more durable, heat resistant, water resistant, lightweight and anti- bacterial. Upgrade your professional services, or empower your client, with these fine DS Artisan Signature luxury performance brushes. Each brush is truly a hand crafted fine piece of art. 9.25” Length. Includes beautiful protective storage travel bag.